Poorly ground powder will not flow properly in the mold and, as a consequence, may cause longer oven cycles. It can even reduce part impact strength due to insufficient densification (cure) of the powder. Quality powder, on the other hand, will fill threads and flow around inserts better, reducing scrap. For these reasons, the flowabilty test is one of the most important tests a rotomolder can perform. This inexpensive test equipment is a must for all rotomolders. These 10mm Funnels are in compliance with ARM 2.1, and are produced in aluminum, finished and anodized for proper flow measurement. All ARM 2.1 compliant funnels are tested and certified. Flowability and Bulk Density Tests can be performed in less than five minutes. Funnels are also available for ASTM D1895 Method A and ASTM 1895 Method B. Method A kits are produced in aluminum. 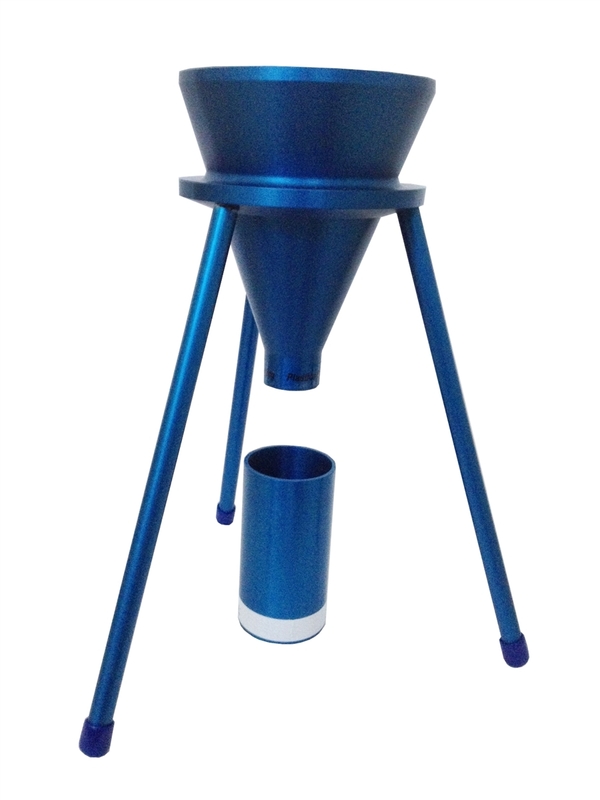 The Method B Funnel Kits are available in Aluminum, Hard Coat Aluminum and Stainless Steel. The Method B Funnels are tested with masterbatch pellets. These Cups are supplied as part of the kit and also measure an important parameter for rotomolding resin. Bulk density is important because it determines the powder's ability to fill low volume molds. Bulk Density cups are tested with masterbatch pellets. 3 piece kit. Approximately 8" tall.